I enrolled in Craftsy's Design It, Stitch It: Hand Embroidery(affiliate link) class in January as part of my goal to learn how to hand embroider. I grew up doing counted cross stitch so I knew it wouldn't be that hard, but I wanted tog get a good foundation instead of just winging it. I jumped in with both feet, with a trip to Hobby Lobby o get embroidery floss and patterns and I started the lessons. Jessica Marquez from Miniature Rhino is the host. She's young, cool, and makes you feel like you can create all sorts of cool things that you'll actually want to make with embroidery. There's eight lessons, and within these she goes through more than two dozen different embroidery stitches. She also shows different methods to do the same stitch. The first six lessons focus all on stitches. 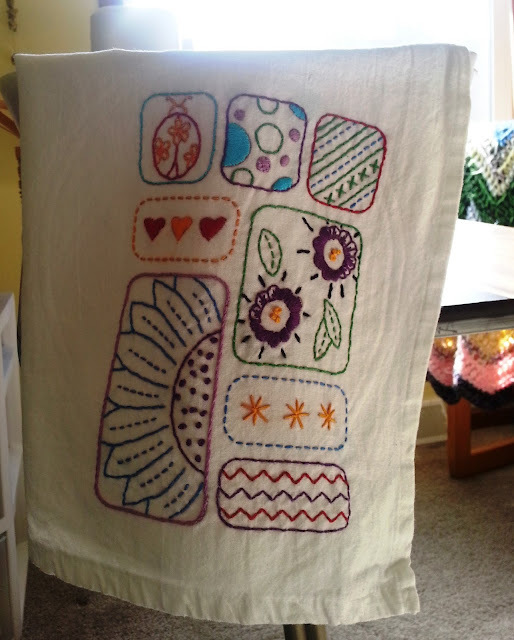 Jessica and Craftsy give you a sampler pattern that you can make to practice all your stitches and then assemble it into a cute little quilt, but I wanted to makes something more practical, so I just used an iron on pattern I found at Hobby Lobby and embroidered a dish towel. I love embellished dish towels. (If sewing is more your thing, check out this tutorial for freshening up your dish towels.) I didn't try out all the stitches like I would have if I had made the sampler, but I managed to squeeze the stem stitch, lazy daisy, satin stitch, french knots, fern stitch, and a few others into my little project. The last two lessons are about embroidery on knits and designing your own patterns. It was pretty interesting and I really learned a lot. So why did I wait so long to tell you guys about it, if it was so awesome? Well, because I'm a constant unfinisher. I was nearly done with this towel. All that was left was a few lessons to watch and about half an hour of embroidery. And it sat on my desk. Languishing away. Thank goodness Craftsy access never expires! I'm not sure why it sat for so long, other than it got warm and I was spending more time outside. But, since I made June my "Month of Finishing", I decided to get it done. So, today, I did. And now I'm all amped up to make more, but think I'm going to make myself finish up a few more of the unfinished projects before starting another. 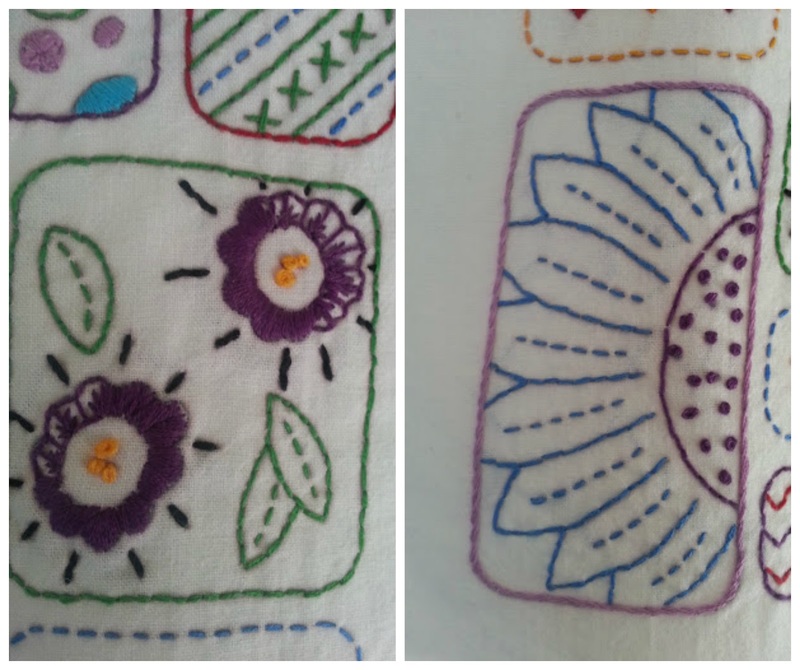 Love the fern stitch on the purple flowers on the right, and the French knots on the right. 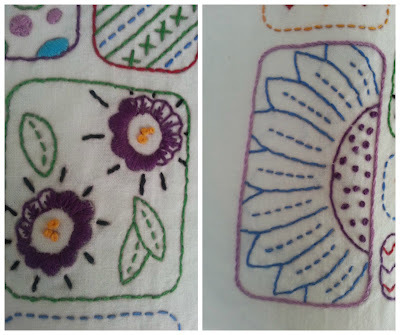 Have you tried hand embroidery before? If you have, what's your favorite stitch? And if you haven't but would like to, check out Jessica's class on Craftsy. (Craftsy links are affialiate links, but all thoughts are my own.) It's on sale right now for only $19.99. And like I said, access never expires, and you can watch the videos whenever you want, at your own pace or even skip around if you like. It's totally up to you.